Beginning with the Arab Spring, high-profile protest movements erupted in several emerging and developing countries over the last few years, giving people around the world the opportunity to participate in politics in less traditional ways. Millions have demonstrated, and activists have pioneered new forms of online engagement, but who really participates and how? Here are five takeaways from a new Pew Research Center survey on political engagement in emerging and developing countries. 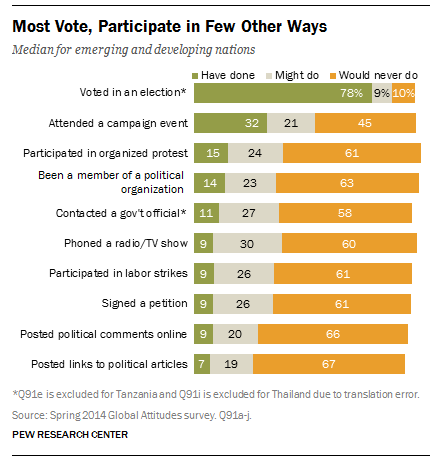 1Most people vote, but they participate in relatively few other political activities. Whether they are required to by national law or they do so out of civic duty, most people in emerging and developing countries vote. A median of 78% say they have voted at some point, more than double the amount of any other political activity tested, including attending campaign events and protesting. Participation in online political activities is low – just 7% say they have posted links to political articles and 9% have posted online political comments. 2Young people shy away from some traditional forms of participation, including voting and contacting government officials. For instance, in Malaysia, 43% of 18- to 29-year-olds say they have voted compared with 87% of those 50 and older – a 44 point difference. However, young people are more likely than their older counterparts to participate in other ways, especially through online activity. In 22 of 31 countries, 18- to 29-year-olds are more likely to post links to political articles and comment about politics online. 3Compared with those 50 and older, more young people believe political action influences government, particularly less traditional forms of participation. In many countries, young people are more likely than their older counterparts to say online participation and protest are effective ways to influence government. For example, in Chile, where last year thousands of students joined protests to demand free education, two-thirds of 18-to 29-year-olds believe protesting is an effective way to influence government, while just 43% of those 50 and older agree. 4The Middle East displays relatively high rates of participation among the regions surveyed. In the home of the Arab Spring and its aftermath, a median of 53% fall into the “high” category of our participation index. 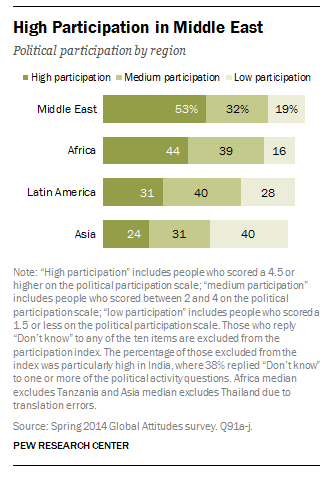 While Egypt stands out as having the highest participation on a number of political activities, participation is also relatively high in several of the other Middle Eastern nations surveyed, including Jordan, Lebanon and the Palestinian territories. Involvement in politics is less prevalent in Asia and the formerly communist Eastern European nations included in the survey. 5On average, people in emerging and developing economies are unlikely to believe that an individual can have an influence on his or her government, a concept known as political efficacy. A median of just 19% across the 33 nations surveyed believe that government officials care what they think. While relatively low, this is roughly comparable to figures from a 2014 Pew Research Center poll in the United States, where 20% of Americans say elected officials care what people like them think. Jill Carle is a research associate focusing on global research at Pew Research Center.